Stephanie Watson, Ph.D., chair of the University of Central Arkansas College of Business’ Department of Accounting, is the 2018 winner of the Arkansas Society of Certified Public Accountants’ Distinguished Achievement in Accounting Education Award. The award recognizes full-time, college-level accounting educators for excellence in teaching and prominence in the accounting profession. Watson will be recognized at the ASCPA Accounting Educators Conference in May. Watson has served as chair of the College of Business’ Department of Accounting since 2015. She came to the college in 2003 as an assistant professor and was promoted to associate professor in 2009. She earned her bachelor’s, master’s and doctorate in accounting from Louisiana State University. She’s been a certified public accountant since 2010. Watson has co-authored several journal articles on topics ranging from accounting education and foreign and domestic taxation to interview etiquette and tax court. 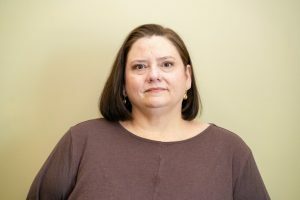 She received the College of Business’ Administration Excellence in Service Award in 2007 and 2015, and its Administration Excellence in Teaching Award in 2005. She received the Beta Alpha Psi’s Outstanding Faculty Advisor Award in 2011. Watson was included in Who’s Who of American Women in 2008 and Who’s Who Among American Teachers and Educators in 2007. Watson is a member of the American Accounting Association, Arkansas Society of CPAs, Association of Certified Fraud Examiners and Beta Gamma Sigma. The UCA College of Business is the fastest-growing college at the University of Central Arkansas with more than 1,650 undergraduate students and 150 graduate students. It offers 13 baccalaureate degrees, two master’s and one graduate certificate across four academic departments and houses the state’s only insurance and risk management program. The UCA College of Business is accredited by the Association to Advance Collegiate Schools of Business (AACSB). Visit uca.edu/business for more. Ron Duggins, M.B.A., Ed.D., assistant professor of Innovation & Entrepreneurship in the UCA College of Business’ Department of Marketing and Management, was recently featured on THV11 to discuss Black Friday and holiday shopping. Duggins provided tips for shoppers to research and locate the best deals and sales during Black Friday and Cyber Monday to complete Christmas shopping. Duggins was interviewed by THV11’s Erika Ferrando. 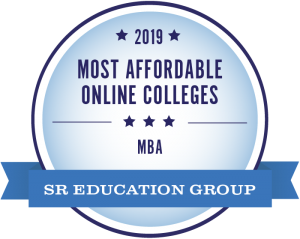 The UCA College of Business’ Master of Business Administration and Bachelor’s in Business Administration programs have been rated among the most affordable online degree programs in the country. The college’s MBA program was rated the No. 4 most-affordable online among peer programs, and the BBA the No. 24 most-affordable. The BBA program was the only Arkansas program listed, and the MBA program was one of only two from the state to be recognized. The programs received the high marks from SR Education Group which gathers tuition rates from institutions across the country, as well as details about coursework and available degrees, to evaluate institutions’ online programs for quality, affordability and accessibility. To be considered for its ranking, an institution must be regionally accredited and offer at least one fully online degree. The College of Business’ MBA program has 133 students and offers concentrations in finance, health care administration, information management and international business specialization. It was recently rated among the best available in the country by The Princeton Review. The college’s BBA program in General Business has 338 students, including 60 fully online, and is designed for students who desire a breadth of knowledge in various disciplines rather than one. Ashlyn Hendrickson’s long-term aspirations would take her high into the ether as well as the ranks of the Air National Guard. Hendrickson, a senior airman in the Air National Guard, plans to obtain a slot in undergraduate pilot training after graduating in December and begin the slow, steady climb to general. She’s already started work on a private pilot’s license now. 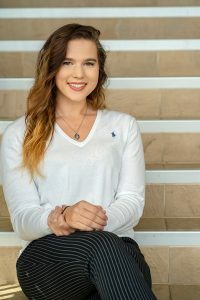 It may be hard for some to see how a bachelor’s in business administration and a minor in marketing pairs with her career objectives, but not for Hendrickson. She came to UCA with her associate’s in aeronautical science, a degree earned from the Community College of the Air Force through a partnership with another institution in the state, and wanted a degree she could use beyond her plans in the military. She’s already seeing the benefit. Hendrickson runs The Rising Six, a National Guard organization, which has given her space to practice what she’s learned in her marketing classes. “My classes have taught me how to organize and run that organization more efficiently,” said Hendrickson. When she took the helm of The Rising Six, it lacked any presence on social media. Parker Woodroof, Ph.D., assistant professor in the College of Business’ Department of Marketing and Management, was who initially attracted Hendrickson to marketing. She was an economics minor but switched to marketing after her first class with Woodroof. Woodroof played a role in readying Hendrickson for a professional trip to Washington, D.C., last spring to meet with members of the U.S. Senate and U.S. House of Representatives. Hendrickson serves as junior committee chair for the Arkansas chapter of the Enlisted Association of the National Guard of the United States (EANGUS). The group traveled to Washington, D.C., in the spring to speak with Congress about legislation. Her time in the College of Business has been transformative for Hendrickson. Wherever life takes her following graduation, Hendrickson is happy for the experience she’s had in the College of Business. “It is preparing me for life because of its great standard of learning,” said Hendrickson. The Business & Information Technology (BIT) Club is having its last meeting of the fall semester on Thursday, November 15th. The event, which will be held in the College of Business Auditorium (Rooms 107/208) during X-period (1:40 – 2:30 p.m.), is open to all majors on campus. 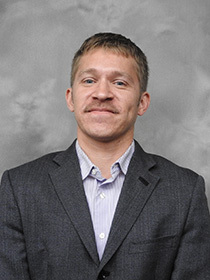 Mike Casey, Assistant Professor in the MIS Department, will be the featured speaker. Mike is a proud UCA graduate and the son of Finance Professor Dr. Mike Casey. Refreshments will be served (PIZZA!) and door prizes will be awarded. All students, faculty, and staff are invited to attend. Johnny Allison’s first lesson in business came the summer he and his brother pined for a Cushman Eagle motor scooter. For brothers in a blue-collar family, work was the only option to obtaining it, so they spent their school break digging ditches in their father’s mobile home park. At the end of the summer, they had $250. Still $100 short of the money needed for a new scooter, they borrowed the rest from the local bank, making $8 a month payments on their loan. The next summer, when Allison was 13, he worked in the office with his father, selling mobile homes. In 30 minutes, Allison sold a mobile home to a couple and netted nearly $1,000 in profit. Something clicked for him. Allison, now chairman of Home BancShares, the parent company of Centennial Bank, shared this story and more with UCA College of Business students Oct. 30 as the keynote speaker of the Davis Family Lecture Series. Throughout his adolescence, Allison worked in the family business, taking credit applications, swapping and trading trailers, cashing contracts, making bank deposits and more. “I was getting a Ph.D. in finance and didn’t know it,” he said. When he finished college at Arkansas State University, Allison moved to Conway to work in the mobile home business. By his late 20s, he owned multiple mobile home factories and managed upwards of 1,000 employees. His transition into banking wasn’t expected, but instead was an opportunity he saw promise in. Allison was on the board of First National Bank of Conway when at his second meeting he learned of a possible acquisition from a bank out of Little Rock. Before that acquisition could happen, Allison decided to purchase the bank himself. “I went from the smallest shareholder to the biggest and chairman of the board,” said Allison. Allison said his years in the retail mobile home business prepared him to be a banker. Fifteen years later, he sold the bank for $2.7 billion. In 1998, Allison re-entered the industry, purchasing the Bank of Holly Grove with Robert “Bunny” Adcock Jr., co-founder of Home BancShares and UCA Board of Trustees member. “They say Johnny started with the $5 million purchase of the Bank of Holly Grove and a bunny,” Allison quipped. Now, Home BancShares has nearly $15 billion in assets and is the top-ranked bank in Forbes’ 2018 Best Banks in America list. Its wholly owned subsidiary Centennial Bank has locations in Arkansas, Florida, Alabama, and New York. Allison said he was humbled to be speaking with students, and hoped his talk would inspire someone in attendance the way a similar talk from Kemmons Wilson, founder of Holiday Inn, had while he was in college. The Davis Family Lecture Series was established in 2010 through a gift from Granger and Jan Davis, and Milton and Claudia Davis. The series features prominent business leaders who have made a significant impact in an industry. Past speakers include John W. Bachmann, Steve Williams, Hank Henderson, Reynie Rutledge, Marcy Doderer, and Millie Ward. UCA College of Business Dean Michael B. Hargis, Ph.D., thanked Granger and Jan Davis, who were in attendance for their generosity. UCA President Houston Davis thanked Centennial Bank, Home BancShares and the Allison family for being longtime partners of the university. Jeremy Horpedahl, Ph.D., an assistant professor in the UCA College of Business and ACRE scholar, has been featured multiple times recently to discuss the minimum wage ballot initiative on the ballot in today’s general election. Horpedahl was a panelist Oct. 19 on AETN’s “Arkansas Week,” and was interviewed by THV11 on Oct. 30. Horpedahl’s commentary was also featured in the Chicago Tribune. He was also featured in a Nov. 4 article by Heather Long of The Washington Post. Horpedahl received his Ph.D. in Economics from George Mason University in 2009, concentrating in public choice, public finance, and economic history. His research has been published in Econ Journal Watch, Constitutional Political Economy, the Atlantic Economic Journal, Public Choice and Public Finance and Management. Horpedahl has also published op-eds in a variety of regional and national publications. In addition to his academic publications, several of his policy briefs and papers on favoritism and state tax codes have been published by the Mercatus Center at George Mason University. A celebration of life service will be held Saturday, December 1 at 10:00 am at the First Baptist Church in Russellville AR, 200 South Denver Ave. In lieu of flowers, the family requests that donations be made to create a scholarship fund for students to attend the UCA/Acxiom IT Careers Camp at UCA. Donations may be made in memory of Dr. Ron McGauhey online by visiting www.uca.edu/give or by mailing a check to the UCA Foundation, located at 201 Donaghey Avenue, Conway, AR 72032 and denoting the UCA/Acxiom IT Careers Center Fund in the memo line. Dr. McGaughey started the UCA/Acxiom IT Careers Camp in 2007 with Ms. Allison Nicholas of Acxiom Corporation. The camp is designed to promote interest and technical experience among high school students as they prepare to enter college. Dr. McGaughey personally managed the first three camps, and his legacy has continued. As of the last camp, July 2018, 332 high school students have participated in the multi-day experience and many have gone on to major in technology at UCA or other universities. A scholarship fund has been established at the UCA Foundation to offset student expenses at this continuing camp. Studying abroad always seemed like a pipedream to junior Lindsey Worthington. 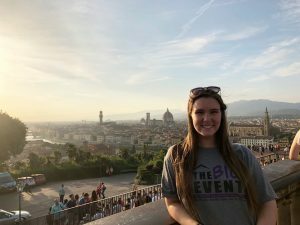 She wished to travel the world, experience new cultures, see new places and meet new people, but for a full-time student on a budget, it always seemed just out of the picture. When she heard about a scholarship opportunity in her Modern Political Economy class with Joe McGarrity, Ph.D., economics professor in the College of Business, she still didn’t believe it was possible. The scholarship required students to have letters to the editor published in local outlets. Worthington’s letter, “Trump Trading,” was published May 11, 2017, by Arkansas Times. Then, the letters were reviewed by a committee put together by McGarrity. The best letter netted the student with a scholarship for a study abroad trip to Italy. Worthington never thought she could win, but she did. Over three weeks in 2017, she visited Florence, Rome, Siena, Pisa, and Orvieto among a handful of other Italian cities. One of her most treasured moments was the time she spent interacting with a local jeweler in her shop. They barely spoke the same language, but the two found a way to interact and learn about one another over the better part of an hour. There was also the countless pieces of art and incredible buildings and architecture. McGarrity said many of his students, like Worthington, have similar experiences, coming back from the three-week journey transformed. Since returning, Worthington looks at many things in a different light, whether it’s exercise after walking extensively in Italy or among the endless trees in Arkansas, a rare treat in the sprawling cities of Italy. Her personal experience is why Worthington thinks scholarships like the one she received are so important to students like her who might not have had such an opportunity without it. 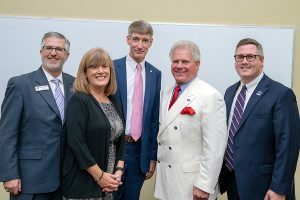 Centennial Bank has become the first bank to establish an endowed scholarship in the UCA College of Business with a $30,000 gift to create the Centennial Bank Endowed Finance Scholarship Fund. The scholarship will be awarded annually, beginning in 2019, to one student per year, known as a Centennial Bank Scholar. Recipients will be finance majors in the College of Business. 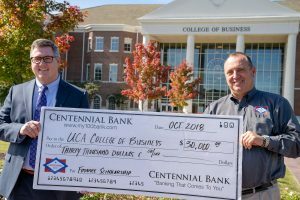 Centennial Bank Division President Greg Sanson said the bank is excited to provide assistance to students pursuing finance in the College of Business. More than 40 UCA alumni and current students are employed by Centennial Bank, making it one of the university’s largest corporate partners. Sanson said this decision by Centennial Bank is important to him on a personal level because of the connection he has to UCA. Centennial Bank is the wholly owned subsidiary of Home BancShares, co-founded by Johnny Allison and Robert H. “Bunny” Adcock, a University of Central Arkansas Board of Trustees member. It has locations in Arkansas, Florida, Alabama and New York. Centennial Bank is the first company to commit to piloting a large scale, multi-discipline internship program within the College of Business. 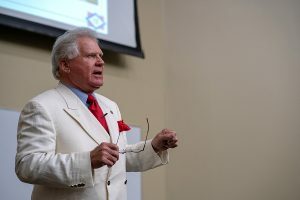 Additionally, the bank established the Johnny Allison Entrepreneurship Speaker Series in 2006, and has brought more than 20 speakers to the College of Business to talk with students, including Rush Harding, Rick Massey, Steve Strange, and former Govs. Mike Beebe and Mike Huckabee. Its most recent speaker was Marshall Stewart, president of Greenway Equipment and UCA College of Business alumnus. Centennial Bank also has the John W. Allison Entrepreneur Endowed Professorship Fund, which supports faculty within the Innovation and Entrepreneurship program. The Innovation and Entrepreneurship program began in 2012 with a cohort of 40 students and has nearly doubled since. Allison is the keynote speaker of this year’s Davis Family Lecture Series in the College of Business. The lecture is set for 1:40 p.m. Oct. 30 in the College of Business auditorium. The UCA College of Business is the fastest-growing college at the University of Central Arkansas with more than 1,650 undergraduate students and 150 graduate students. It offers 13 baccalaureate degrees, two master’s and one graduate certificate across four academic departments and houses the state’s only insurance and risk management program. Visit uca.edu/business for more.